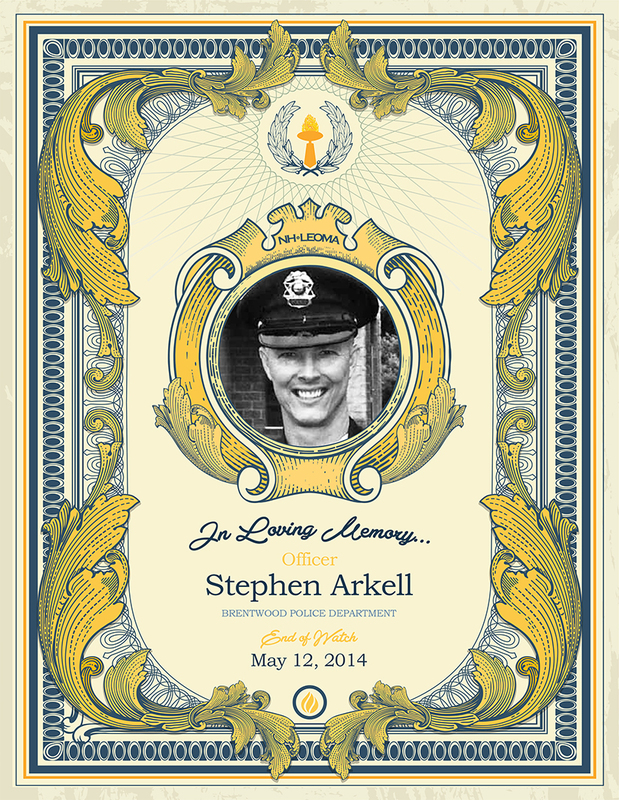 Officer Stephen Arkell grew up in Brentwood, New Hampshire and was a 1984 graduate of Exeter High School and a 1988 graduate of The University of New Hampshire and; he held a B.S. in Communication and a minor in Sociology. He was a dedicated soccer and lacrosse coach and an avid outdoorsman. Officer Arkell became a member of the Brentwood Police Department in 1997, where he served as a part-time Police Officer, and the Animal Control Officer for the Town of Brentwood. On May 12, 2014, at approximately 4:02 p.m. Officer Arkell was dispatched to 46 Mill Pond Road, Brentwood, for a domestic dispute. Upon arriving, Officer Arkell cleared the perimeter to assure resident safety and proceeded to enter the dwelling where he was met with gunfire. Officer Arkell was struck by at least 4 rounds and was fatally wounded. Officer Arkell was posthumously awarded the New Hampshire Police Chiefs Association Medal of Valor for his heroic actions. He is survived by his wife, Heather, and two daughters Kimberly and Lauren. © 2019 NHLEOMA. All Rights Reserved.